Pass Through cabinets manufactured by CMP allow restocking from the sterile core, limiting clean room and OR exposure to contaminants. CMP’s Stainless Steel Pass-Through Cabinets meet hospital, medical, veterinary, laboratory, cleanroom and pharmacy pass-through needs. Pass Through Operating Consoles are configured to your requirements. Access from both inside and outside the OR facilitate quick case turnaround and provide for FIFO rotation. Pharmacy Pass Through Cabinets and Pass-Thru chambers meet USP < 800 > and USP < 797 > Clean Room Compliance for ” Pharmaceutical Compounding – Sterile Preparations”. CMP designs medical pass thru cabinets for operating rooms, laboratories, veterinary clinics, pharmacies, hospital pharmacy anteroom and production facilities that employ stringent isolation procedures. CMP’s Pass Through Cabinets utilize an exclusive interlock system option to lock the opposing doors. CMP’s Electronic Interlock System utilizes updated, state-of-the-art technology that ensures superior operational functionality as compared with the mechanical interlock systems of the past. This fail-safe design immediately locks the opposing door with a more secure safety seal. Mechanically interlocked systems do not hold as tightly. Designed to be install in wall or OR, “Pass Through” Storage Console shall be constructed of Type 304 stainless steel with No. 4 finish. Welding is to be done by Heliarc process, exposed welds to be ground and polished to match No. 4 finish. Dimensions of unit are listed in the Specifications section. Console shall contain one fixed bottom shelf and three adjustable intermediate shelves. Both front and back of the unit shall be enclosed with two full-height, hinged, glazed doors with chrome-plated knob handles and stainless steel frame. Each door shall have 1/4″ (6mm) thick shatterproof, safety-glass panes. 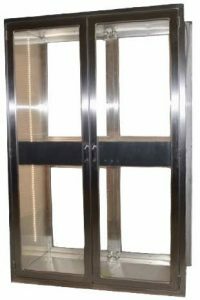 Two sets of doors shall enable loading of the cabinet from one side and unloading from other, thus permitting storing of surgical instruments without entering OR. CMP’s Exclusive Interlock system prevents either door from moving when the opposing door is open, protecting your OR, Operating room, Hospital Pharmacy Anteroom or clean room environment during material transfer. In this way, ensuring that the interlocked door cannot be forced open. Interlocking Doors are an important requirement in Pass Through Cabinets for USP 800 and USP 797 . These models are part of our standard product line. Custom sizes are available.